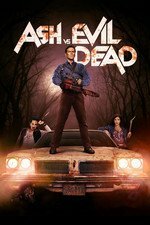 Ruby helps Fisher and reveals her family's connection to the Evil Dead; Ash and team follow a clue from the demon, Eligos. When Ruby rammed the stake into bookstore dude, that little yell she made gave me such a wonderful Xena nostalgia moment. Loved the trip into Ash's subconscious. But this episode I really was feeling the shortness of the half-hour format, I was not ready for that to be the end and to have to wait another week to find out what happens next. Yeah this episode really left me wanting more. Ash was as great as ever. "When Evil shows up, it blows up!" I agree with you guys that this needs to be at least 45 minutes long though. When I recommend it to people, I'm going to tell them to wait and binge. I'm not having that much trouble with the half-hour format because my feeling is that a full hour would give them more time to screw things up. Because I'm not that happy with the show since the pilot. The pilot was very good. Since then, each episode has seemed to me to be weaker than the previous. This one was a disappointment, despite a handful of funny lines. I thought this one was better than last week. "A city so nice they named it Jacksonville." You can count me in the crowd that thinks the episodes should be longer. I think the length just doesn't allow enough time to focus on more than one thing, so it becomes even more glaringly obvious that, as much as I enjoyed Ash's trip, not a whole lot happened in this episode. And, yeah, Lucy Lawless is almost definitely not Annie's sister.